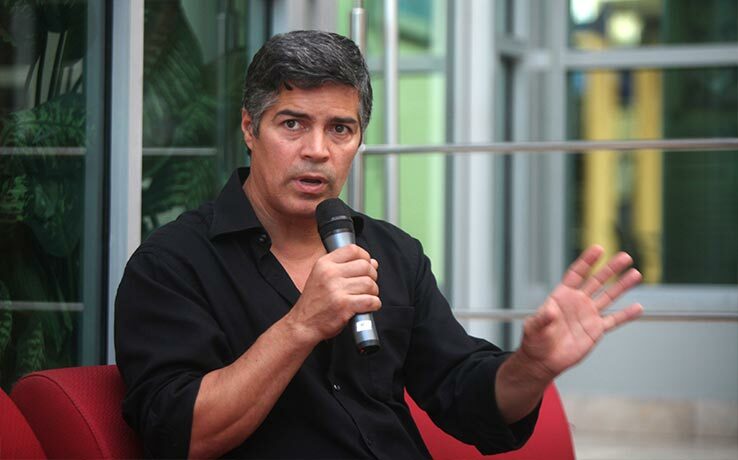 Morales participated in a discussion at Café Filó in the Juan Bosch Library as part of the program of activities for the 7th edition of the Dominican Republic Global Film Festival (FCGD). “You must maintain an emotional balance between the personal and the professional, and not see yourself as a god; if you become successful at an early age, you shouldn’t believe that you are a god,” he said. He said that choosing a script is difficult because it doesn’t always mean the movie will be good. “In the development of a film there is the recording, the acting, and even if it follows the script, this does not mean that it will turn out well,” he said. He urged actors to be humble, “keeping your eyes and your mouth shut,” in order to obtain knowledge from all the work done. The international actor talked about the development of his career and the experience of working with major film stars and directors. Esai Manuel Morales is an American actor of Puerto Rican origin. His breakthrough role in La Bamba made him a star, contributing to making the film the most commercially successful Latino-themed & Rock biopic of all time. Morales unforgettable role as Lieutenant Tony Rodriguez in the Emmy award-winning series NYPD Blue broke new ground and gave him critical acclaim. In 2002, Morales won The Alma Award as “Best Actor in a Television Series” and was honored as Entertainer of the Year at the 17th Annual Imagen Awards for his work on NYPD Blue. He won an Imagen Award for Best Actor for his tour de force performance on Gun Hill Road and an Imagen Award nomination for Best Supporting Actor in a Television Series for his work in “American Family.” His performance on Lifetime’s We Have Your Husband won him a NAACP nomination. He is a founding board member of the Earth Communications Office (E.C.O.) a clearinghouse for environmental information and has worked closely with the Wildlife Preservation Fund in Costa Rica and Health Education Aids Liaison (H.E.A.L. ).